A thermal bath in Gobholo Cave? Yesterday Darron and I found a hot spring in Gobholo Cave. Or rather a warm trickle of thermal water in a small passage that is a continuation of a passage formed in a remarkebly clear weakness zone/fissure zone. Is this a mere coincidence or are the fissures so deep that they can transport thermal water into the cave?! This whole area is different from the other parts of the cave I have visited; the boulders are not yet separated, but still clearly part of the same rock formation. There are however many fissures, with black weathering crusts, dividing the core stones in the wall and the ceiling of the passages here. 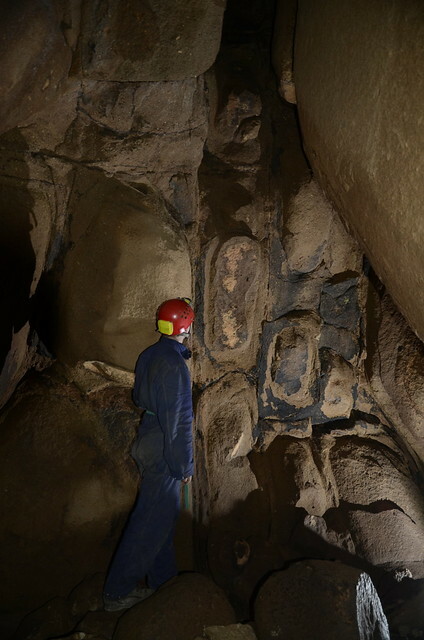 To me this is the clearest indication so far that this boulder cave is not formed by a rockfall but by deep weathering in a fault zone (the same that was the origin of the valley) and later removal and transportation of the weathering products by Gobholo river. Anyway, all that remains to be done in Gobholo Cave is to erect a dam for the thermal bath, and construct a hole down for the pizza delivery.